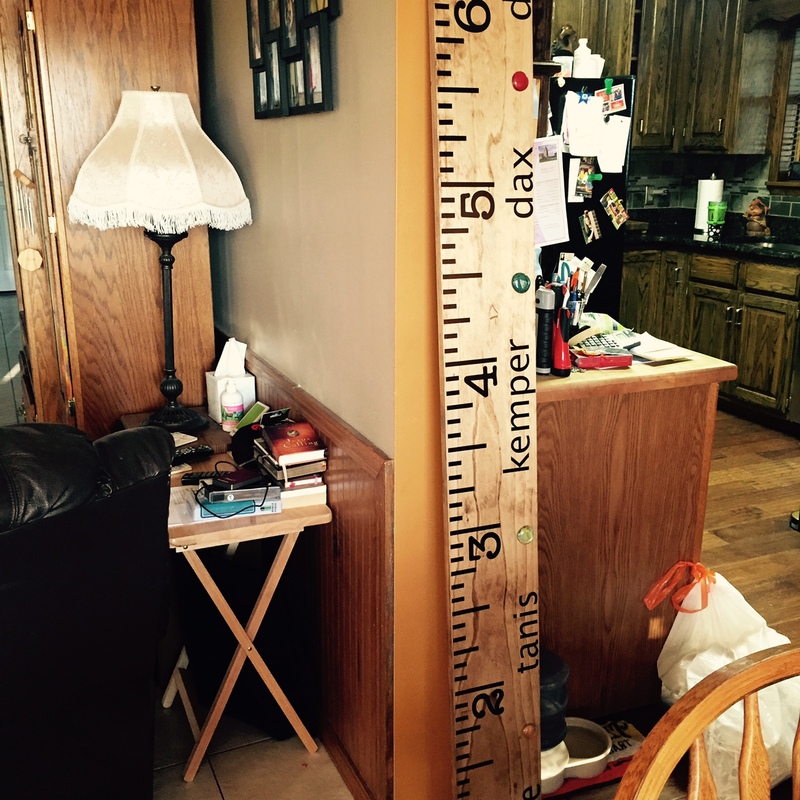 I’ve wanted to try one of those giant rulers to use as a growth chart for a while. I thought my Dad’s 65th birthday would be a great time to try. He’s very handy and crafty so I thought he’d really like it. I’ve seen them all over the interwebs and I wanted to try my hand at them. I didn’t want to do all the measuring to make sure I got it all right, so I looked on Etsy.com and many people offer kits to make these, usually made with vinyl decals. I have a Silhouette Cameo, as you all know, and I thought for sure, I can find a template and cut them myself. Check out her other projects, too…..CUTE!!! She provides terrific instructions for how to make it as well. First I stained the board using a light stain. You could use any color you like, but I thought since you’ll probably want to write the children’s heights on there — you’ll want to be able to see the writing. The board didn’t need sanding and I used an old t-shirt to apply the stain. Next I cut out the vinyl — using my Silhouette Cameo and the download file from the link above. I also cut out all the kids names to run down the side — you could really do anything you’d like to personalize it! After using transfer paper — you want to make sure that things are straight as possible. Then I laid down the polyurethane gently over the top using a short paint brush. This will ensure that the stickers don’t peel up over time! My 5 year old son (big Red) wanted to help, so each time I laid down a section — He pulled off the transfer paper. He was so slow and methodical about it. It was so sweet. After we got it all laid down he picked up some glass stones and put them between each name — he even picked each one of the colors himself. He was so sweet and so loves helping. I love the way it turned out. 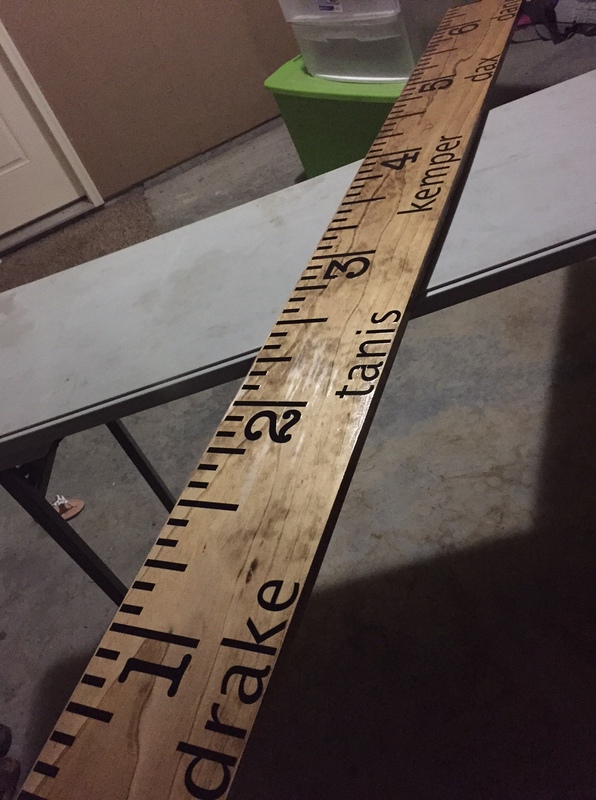 Your ruler turned out GREAT!! I bet your dad loved it as his birthday gift. How thoughtful! I’m so happy my cut file and tutorial were of help to you….thanks for sharing! !